Tuesday (8/30) morning, the sky scrubbed clear bright blue by the previous day of rainstorms, I headed out of Manderson to the Wounded Knee monument. It's a very small cemetery for such a big, sad story. My friend packed me off with a half-pint of homemade chokecherry jam and said "Custer is scenic." I looked it over on the map, not knowing quite what to expect -- I had been interested in seeing what hot springs options were available in Hot Springs, and hadn't thought much about my itinerary after that. 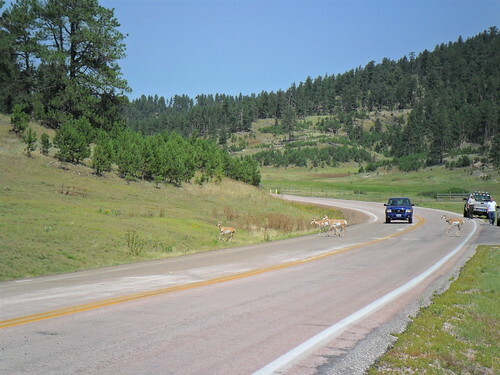 There was construction on Route 18, leading from Pine Ridge to Oglala - the entire road was torn up, with queues of cars waiting for pilot cars to lead them through, one direction at a time. 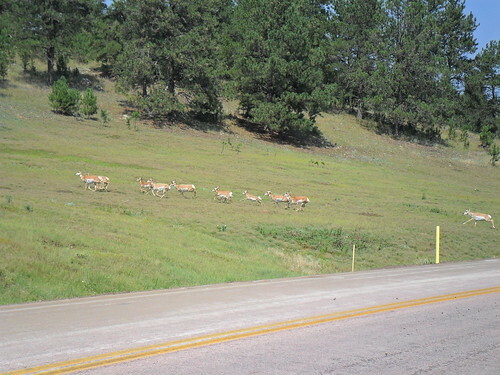 I noticed a nice road leading to Route 385 which would send me up to Custer. I got to see lots of trailers and a few ranches -- and then just a few hundred feet away from a "Road Closed" sign was a wide river with no way across. 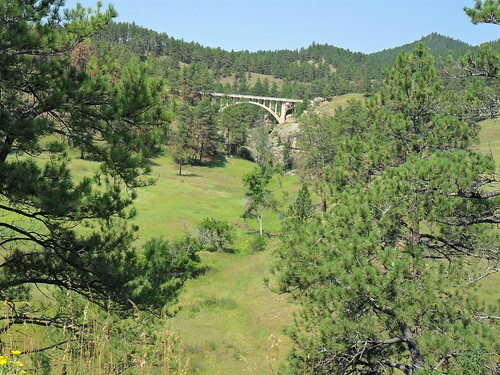 A sort of scenic 10 mile loop - and I returned to Pine Ridge, fueled up and got to the head of the queue to take the torn up roads north. Between Nebraska and South Dakota, I have seen more women operating heavy equipment on road crews than I have ever seen in my entire life. It seems like women are relegated to traffic and flag duty here - but in NE and SD - they are running the graders and the tractors. Why not, right? The Harley Davidson I passed (he was waiting in the middle of the queue!) - seemed to be holding up traffic behind me. Once I got past the pilot car, there were more torn up areas but one look at my motorcycle and the flagger sent me ahead of the pilot car saying, "you're fine!" The ride along Hwy 18 was full of easy rolling hills - mostly flat but compared to Nebraska, downright mountainous! There were some interesting geological features - broken away hillsides with multiple layers of color showing through. 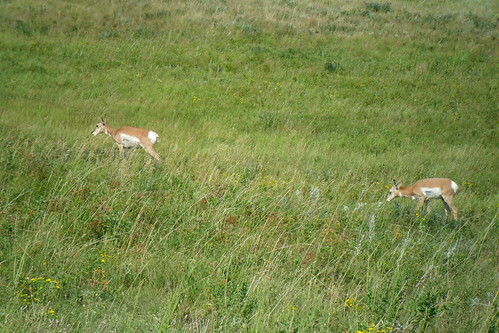 I saw lots of antelopes and horses on this trip - the first horses and antelopes I really saw were on my way into Utah. 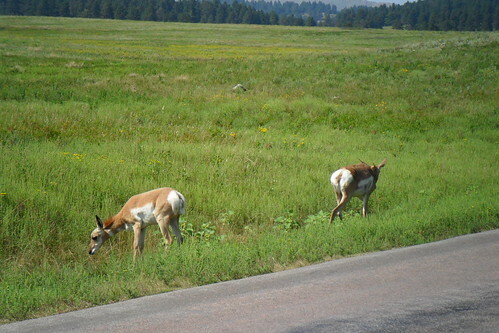 Just before SLC, I saw 4 antelopes, standing shoulder to shoulder, in a line at about a 60 degree angle away from the side of the road ahead of me on my right - just looking at the freeway. I also saw herds of horses by a gate - like they were waiting for dinner. I saw dogs hanging out with horses in pens on my little short cut earlier in the morning - horses in small pens don't look like they are having nearly as much fun. As I made my turn north, I saw five horses making a turn from the backside of a small rise, just running at full speed with their manes and tails streaming. They looked like they were just having fun - there was a black horse, a white horse, a palomino and two red and white horses - just running. Then, as I passed the hill - there was a Cowschwitz: hundreds of cows confined in a small area with mud up to their knees - it just smelled awful. I couldn't help but think that the horses were celebrating the fact that they had a superior set-up compared to their bovine neighbors. Hot Springs was a cute little town with more modern buildings and gas stations at the south end, more brick "wild west" themed edifices at the north, older part of town. I found materials on the available water features - they all looked like they were big commercial developments, swim suits assumed. I decided to take a pass and get a sense of the town. It was a weekday and the town was pretty quiet. I popped into a small antiques store with a cafe in the back - kitschy and cute, but nothing compelling enough on the shelves or menu. As started to leave town, I came upon a fantastic little natural foods grocery store called Earth Goods (http://earthgoodsnaturalfoods.com/) and bought some juice and snacks for a late breakfast. 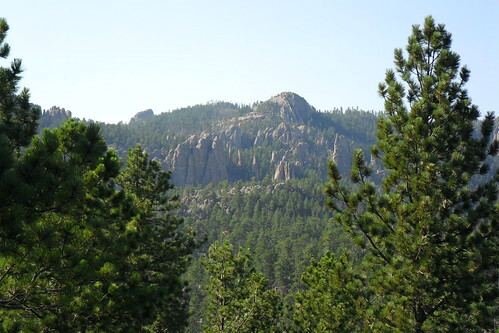 The cashier, Teresa, was totally helpful both in helping me find items I wanted (pack-type foods) and she gave me some great tips on Custer State Park, as well as a local tourist map. We debated the benefits of different attractions - she said the Wildlife Loop was definitely worth visiting, though there were animals all over - and she agreed with me, "A cave is a cave - you can see the more interesting stuff up on top (animals)." I loaded up my new provisions and drove past the old Wild West brick buildings, and the scenery definitely changed - more altitude, more trees - it just got prettier and prettier. It seemed like I got there very quickly and found a ranger station at the entry to the Wildlife Loop. I asked about tent camping and places to swim - and the man at the gate was (again!) incredibly helpful. 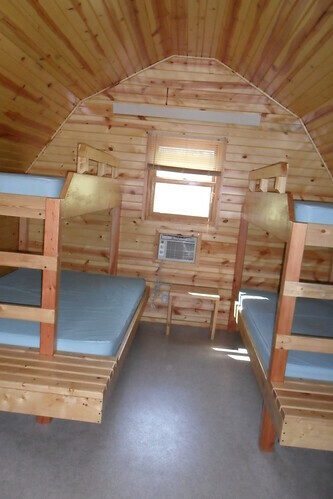 He told me that there were also little cabins and brought me a park brochure open to the page of accommodation options - it was like $50 for one night in a little cabin, so the man brought me a phone and dialed me into the reservations line. 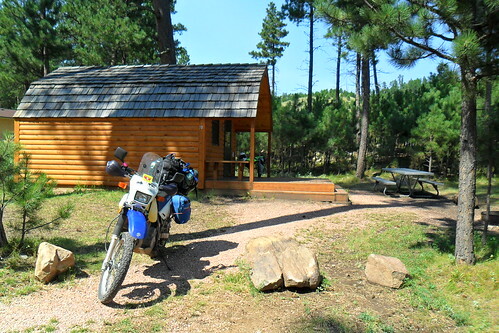 I got a cabin in the Blue Bell campground and made my way there to drop off my gear, so I could go drive all around without having all my stuff on the motorcycle. The rangers at the gate to the Wildlife Loop had put a pink wristband around my handlebar, so they just smiled and waved me through when I returned. 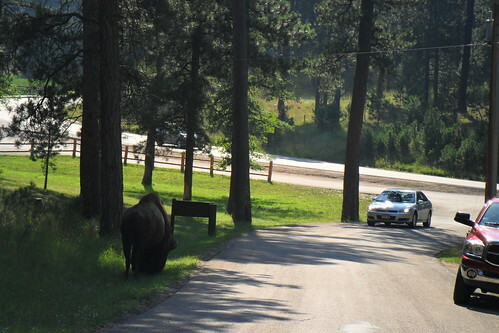 As soon as I went around the bend and through the official gate - there was a GIANT bison standing to my right, at 90 degrees to the road, looking just like the bison on the back of a buffalo nickel. There were no other cars - I wanted to take a picture but I was worried about stopping too close to that guy! He was HUGE! 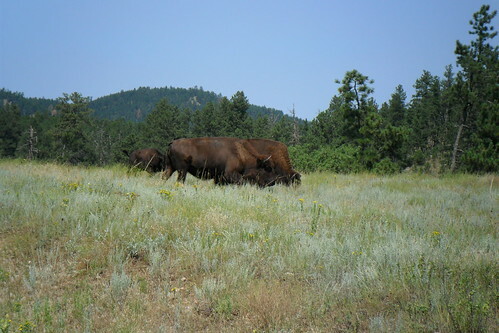 I continued along and saw a few more bison dotted here and there, munching grass solo, seemingly oblivious to my passing by. Then, I saw a man on horseback along to my right - riding along into the bushes. A ranger's jeep and another vehicle passed me up and pulled over - I saw the horseback ranger come out of the woods again and raise his right arm and point. 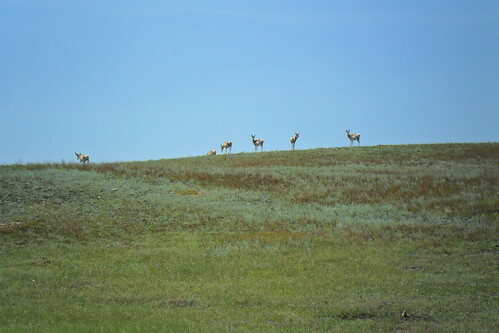 I pulled over IMMEDIATELY and freed up my camera - and was treated to the sight of about 40 antelope streaming from around a hill, down and across a creek, and over the road just about 20 or 30 feet in front of me! The ranger and his guest were also outside their vehicles - the guest had a camera with a lens the size of the Hubble telescope on it - I imagine he got better photos than I. There were a few stragglers - I got back on my motorcycle and coasted downhill on the shoulder in neutral, without turning on the engine, to get a better look. 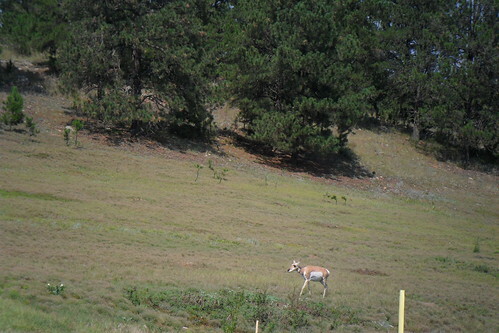 Antelopes are COOL! 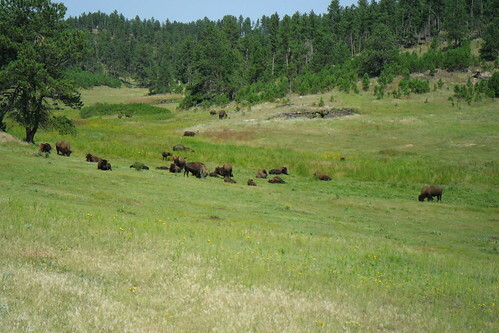 After the next bend, there was a BIG herd of bison just lazing about - and some very cute baby bison. 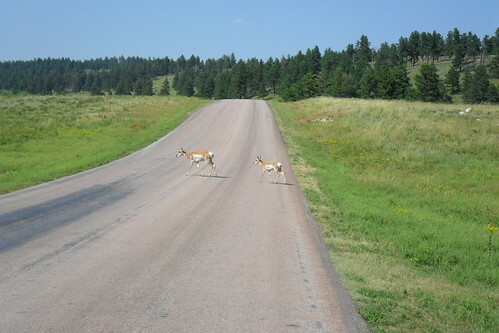 I checked out some dirt roads off the wild life loop and came across more bison and antelopes - and fewer cars (yay!). 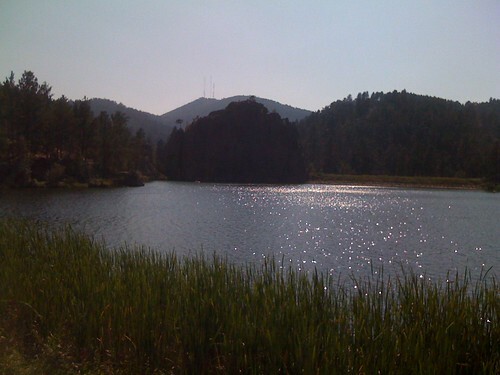 After doing a few loops around, I headed out of the Wildlife Loop area and went to find a spot to park for a swim at Legion Lake. The water was cool but not too cold and I very much enjoyed having some peaceful, quiet time soaking in the water with only 5 other people in this quite nicely sized lake. 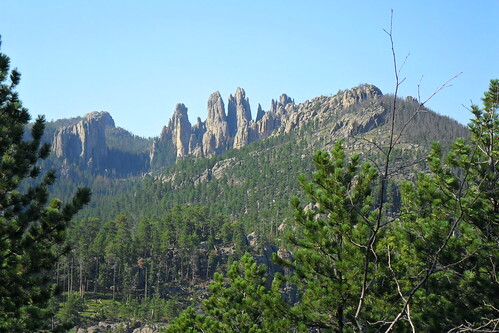 After drying off, I explored more of the park - I drove up, I thought, toward Mt Rushmore but ended up taking the back way in - going through all the scenic rock formations at the Needles and Sylvan Lake. I didn't take many pictures there because I thought I'd end up returning - the traffic was pretty aggravating there, with folks driving well below the 25 mph speed limit (if you're going less than 10mph - just PULL OVER!). 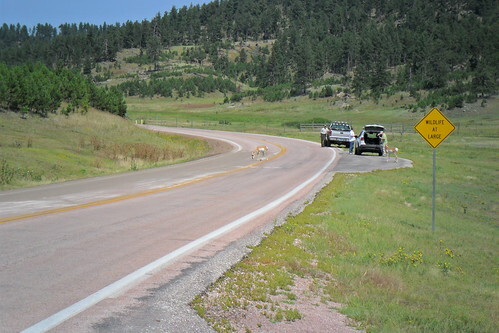 After a stop at Sylvan Lake for souvenirs and a cold drink, I took a turn toward Mt Rushmore and found myself delayed by more road work - I went to the top of the queue, turned off my engine and talked to the flagger. He asked about my trip and expressed disdain for the flyover states, "What do you think IOWA stands for? 'Idiots Out Wandering Around'!" I got a nice view of Mt Rushmore - from the toll gates - but was kind of disappointed that there was no discounted fee for motorcycles (as there are at nearly every other park or attraction I have visited) and there is no way to just walk into Mt Rushmore. It was kind of expensive and I decided to take a miss - heading down toward the center of the park and exploring more of 16A. 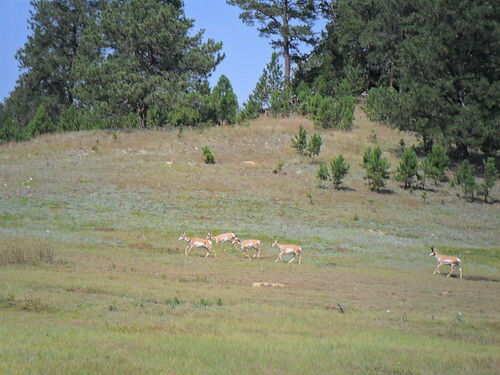 Pictures and words just cannot do justice to how beautiful this park is - no wonder the bison and antelope love it! I would love to live there, too - except for that snow thing. 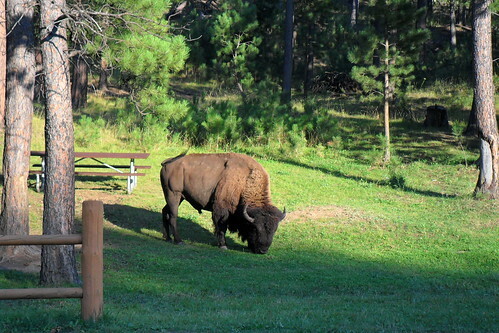 On my second pass by Legion Lake - same bison was still hanging out eating grass. I ended up looking for groceries in town of Custer at Dakotamart - the produce selection was once again, woefully disappointing: grown far away, wrapped in plastic on styrofoam trays. The store seemed to specialize in frozen foods - I have never seen such a crazy selection of prepared frozen foods in my life. The candy selection was poor - pretty much all slavery chocolate by Hershey's and M&M Mars. 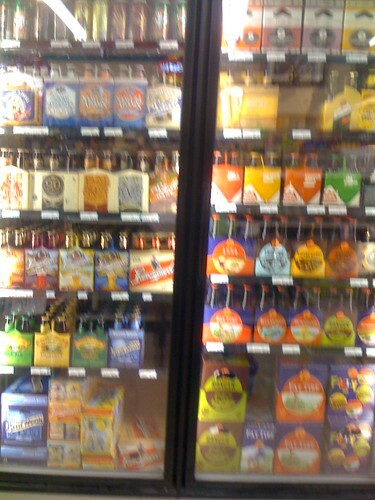 Interestingly, the beer selection was amazing. 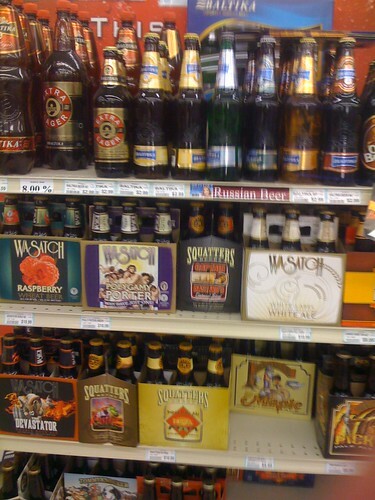 We're talking about 100 different craft, micro and Belgian-style import beers - cold and on the shelf. They had lambics that weren't just the overly sweet variety! They had RUSSIAN beer! I was pretty surprised by this and happy to buy some nice chocolatey stout for my next two nights in camp. On my return, the camp host was outside his RV. I pulled up and cut the engine, flipped up my visor and called out his name and a howdy. He looked at me, put his thumbs into his belt loops and smiled, walked over slowly and said in a distinctive Tennessee drawl, "you know, it has always been a fantasy of mine to have a woman come up on a motorcycle and call out my name!" Then he burst into a gale of laughter and I introduced myself. We had a nice little chat - his wife was out of town visiting her mother, and he was on his own. 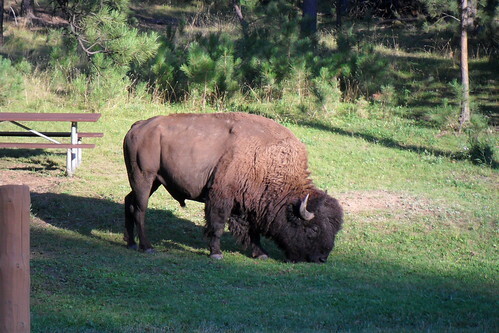 He gave me tips on riding around the bison - he said, "they hate the sound of Harleys!" The mating season had just finished, so I would see larger males hanging around odd places - just trying to have some distance between them and the demands of the wimmenfolk in their herds. My camp host regaled me with stories about motorcycle travel from his younger years. He discovered that going with a group of 3 or 4 friends and seeking out state park cabins (like the one I had rented here) or at KOA campgrounds was a tremendous value - they usually are very cheap and sleep up to 4 people, all you need is bedding and cooking gear, saving lots of weight and hassle in packing gear and worrying about rainstorms. I have to say - I think the man was right! Staying in the little cabin was really a delight - though I found it a bit chilly that night in my 55 degree rated sleeping bag. The camp host also hipped me to the correct direction for driving on 16A to Mt Rushmore - if you go toward Mt Rushmore on that road, you get to see the monument through the cool stone tunnels -- which I missed that afternoon because I went away from Mt Rushmore on that road - enjoying the tunnels and forests but not the view. I spent the evening making my dinner, enjoying beer on my little porch and then had a hot shower. I fell asleep listening to an audiobook on my iPhone and shivered a bit, through the night.